To da loos: Which looks better? Floor to ceiling mirrors or individual vanity mirrors? floor to ceiling mirrors vs. mirrors only above the vanity. Night and day don't you think? Doesn't the 2nd vanity area seem so much larger and look more dramatic? 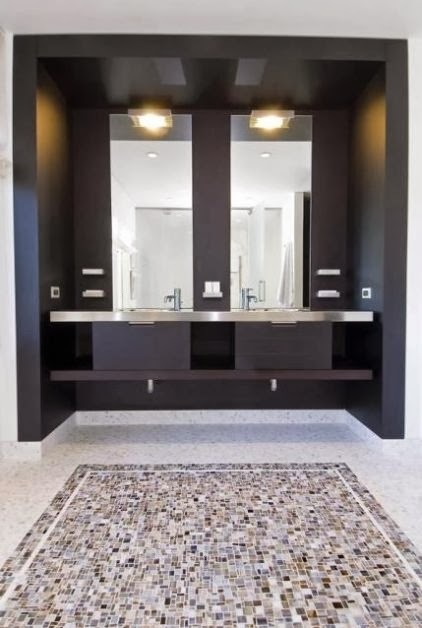 Using floor to ceiling mirrors is a great trick to make a small bathroom feel larger, it's also great for a very dark bathroom, it makes if feel a lot brighter. And what a Wow factor it adds. Tomorrow we'll be looking at a few more floor to ceiling mirrored bathrooms.